As a small start-up, we are always looking to increase our CRO. It's always a question of what works and what doesn't at this very moment. During our first two years, we did manual tests which were often hard to track and most of the time didn't get documented due to our marketing team being a 1 person "department". Convert has changed all of that for us - we are A/B testing and seeing actual results! The ROI is huge. Convert is, in our opinion, the best A/B testing platform out there. We are new users, so we have zero complaints about the product thus far. It's been great! My main focus is always on CRO. With Convert I'm actually able to see what's causing people to convert. "Go as deep and technical as you need to go"
1. Their support is personable and head and shoulders above every other experimentation suite I've used. 2. The depth and capabilities of their tools for experimentation just blew me away. They knew that one size does _not_ fit all, and have provided so many places to inject a script at runtime to be able to decide when and how to run an experiment. This is so huge for me because the app I experiment on is written with wildly changing view layers. The specific feature I'm describing is called "JS Conditions" or DMP Profiling. Definitely give it a shot. If you're technical at all, this will stand head and shoulders above the competition. I'm still so impressed by their DMP features, it seriously opened up the flexibility I needed to run clean and accurate experiments without injecting real code into our codebase. For me, the biggest problem I was solving was, at runtime being able to determine an experiments validity and parameters. I've used Adobe, Optimizely, Google experiments, etc. and none of them really let you get your hands dirty with the code like this. My specific case was needing to (in almost every experiment) have an initial experiment run itself on load and determine (by way of script in the experiment dashboard) whether it should run or not, and if it did need to run, who to target and when. I did not want the software deciding these things for me because of the way our software was setup. Of all the other experimentation platforms, this either required deployments and hard coded experiment triggers, or it wouldn't allow this sort of experiment targeting at all. Our app, on load, can expose a lot of data points about the player that I would then use to determine how to manipulate the experiment and which variation to serve (if at all). Convert lets you do this right from the dashboard. This made deploy and onboarding of the tool easy and fast, and allowed me to flip experiments on and off with ease. "The tool works well and the customer service even better"
The customer service of convert gives constant support to us especially when we need to setup complicated tests that requires code implementation. Tool itself works as it should and provides enough source to run A/B and split tests. User interface is not clean or have limits when it comes to build complicated tests. This makes users dependent to customer service. We ran many a/b and split tests by using Convert and discovered which elements work for us the best on the UX perspective. As the account director I'm always looking to impress customers and the nice UI, fast response time and UI make impressing customers a breeze. I find it really easy to preview tests and refer back to old result where in other platforms its clumsy and slow. "Perfect tool for high volume, e-commerce testing with great support"
For sure the great service and the many data points you get with each plan. This is especially useful for high-volume e-commerce shops who want to do a lot of continues testing. Their amazing Magento plugin really adds to that. Next to that their system is extremely fast, bringing flicker to a minimum. Their statistical engine is a bit more time to reach statistical significance than i.e. Optimizely's or VWO's, but depending on how you look at this it's actually a good thing. Besides that, the only thing I`m really missing is segmentation during or after testing of the results by device, new users etc. within the results page. Targeting of users based on segments is obviously possible. There are also a few inconsistencies in their user interface that I would have liked to see different. This could be personal taste though. Running several test a month for clients, improving their revenue by optimizing their customer experience on all pages and funnels. "Convert Experiences - Superior A/B Testing Software"
Convert Experiences (previously Convert Experiments) is, in my opinion, the best A/B testing software on the market right now. It is my go-to recommendation for any A/B testing requirement. First off, the support is top-notch. It is easy to get hold of the founder/SEO Dennis and if you run into any significant trouble, it's easy to get hold of the senior developers. 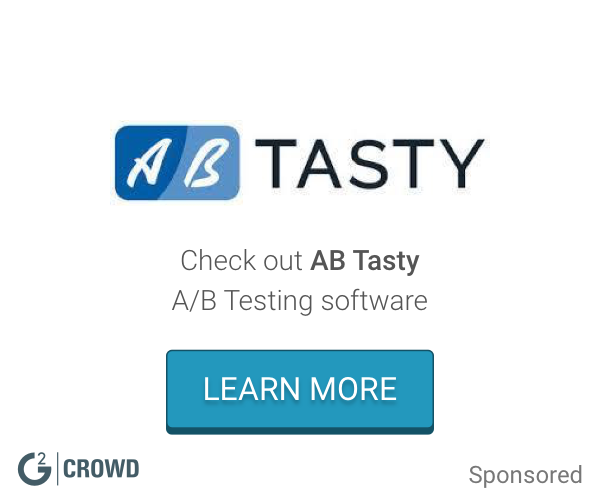 We are advanced A/B testers and Convert is the only piece of software that has these critical features that I have not been able to find anywhere else. I will touch on those elements that are more unique to Convert. 2. Advanced editing. Unlike a lot of their competitors, Convert allows you to edit the variation code directly. This means that you can basically test any website (including AJAX and highly dynamic sites). This is not the case with some other competitors. 3. Easy breakdown and visualization of daily conversion patterns. Surprisingly, this is not available with a lot of A/B testing platforms. We want to see the conversion rate daily so that we can see if there are any validity threats in the test. Most platforms only provide an aggregate of data up to that day. I strongly recommend Convert Experiences. The user permissions handling can be improved, right now it's a bit clunky. I believe it's the most superior A/B testing solution having tested a few out over the years. We are a conversion optimization agency, and help online stores grow. A/B testing is one of our core services. We have used Convert to help our clients grow their conversion rates and revenue. "Perfect solution at a great value!" Having used other A/B split testing software in the past, I like how similar it was in function to others so the learning curve was non-existent after my first test. Specifically to Convert, I like how we can setup custom goals to measure our tests and the reporting adjusts per goal. As with any A/B split testing software, it's not as easy to create tests as a salesperson might make you think it is. It takes a trained professional to help you design and develop the tests as well as define variations, goals, and benchmarks in testing. Convert is one of the easiest tools I've ever used though! Ask questions from their staff! They will train you and provide any help you might need, no matter how difficult or obscure the problem is to you. In our organization, we cannot change items on our website in an agile manner, we do not have the bandwidth to create change in our development team. Convert allows us to design and implement changes to TEST their results without ever having to go through IT. This saves us tremendous amount of resources. We've realized through testing that our customers are very unique to us and do not follow conventional UX norms. Our tests reveal the need for us to constantly better understand our users and design for them. This tool allows us to better target and design for our users. "Great product and fast support"
I like Converts SmartInsert (flicker-free testing) and integration with Google Analytics. Because they don't have post-test segmentation features (which we don't use, we do test analysis in GA) their app is much cheaper than other alternatives. It enables fast and trustworthy experimentation and hypothesis validation. We are using it now for a campaign so I’m relatively new to A/B testing. We selected Convert because of the consulting services they offered on top of the tool. They basically developed our variations for us based on our mock-ups. We had a training but we really on check the dashboard and reports once the experiments are done. We don’t have that many developers on the team available now so this worked out well. So I love their interface but I like the service part best. It’s not super clear how all the math works so it would be good if that was clearer stated somewhere. Our project was about speed and all the other tools we checked had service plans in thousands of dollars a month. So getting started fast and at a budget that was worth the risk. So far one of the three tests we ran compensated for all the time and money invested. "Convert Experiments - A Value Add & a handy A/B Tool"
Convert is more an agency tool and it's focus is clear helping us with the tool without installing to many client website tags. I love it because it saves us time communicating back and forth with clients. One example is the collision detector or however they call it. We can setup test that do not conflict with each-other. Handy. We moved from another tool because of two reasons: Pricing and Blinking. The pricing of Convert is great compared to other enterprise tools and if you go for performance and not A-brand this is the way to go. Now what helped in the switch was also that they don't blink as much as other tools we tried. Unless you use bigger images Convert makes the swap of original and variation fast. It takes a bit of time to get used to it's like a hybrid of VWO (wizard style) and Optimizely hiding everything in menu's, documentation is to much to handle so went for chat and they gave us onboarding training. When you are lost don't go and search all the documentation (they have a lot) just go to chat, usually within several minutes someone is on the case. It's not always solved right away but it's faster then searching and support tickets. Our client for this project made some big jumps. After 6 months we saw the first bigger wins of around 15% a test resulting in revenue jump of several tens of thousands of dollars. "As Great As an A/B Testing Platform Can Be"
Be warned, the visual editor is useless (and the same must be said for that of all the competitors) because there is simply no substitute for being able to code. But even if you're an amateur front-end web developer, you'll do alright with Convert.com because of their responsive support team and good documentation. Convert.com also has an excellent user interface, which is why I enjoy using it more than VWO. And it goes without saying that it blows Optimizely out of the water. I would definitely recommend Convert.com to anyone looking for a good A/B testing platform. Convert.com has a pretty nice user interface as far as aesthetics go, but there's some room for improvement when it comes to navigation - it just isn't laid out in an intuitive manner. It's got a nice design, sure, but that doesn't mean much when it takes 10 minutes to figure out how to edit a variation. There's a learning curve with any A/B testing platform already; it's frustrating to have that curve steepened for Convert.com because the designers gave poor thought to their flows. If you're a startup on a tight budget, don't let stinginess drive you to settle for Optimizely. But don't swing too far in the other direction and splurge on VWO if that's not in the budget, because frankly, Convert.com is just as good in all but one area - documentation - but it makes up for that deficiency in the responsiveness of its personal support team. Give Convert.com a try. Be patient at first because it can be difficult to navigate, but definitely give it a fair chance and I think you'll be impressed. A/B testing pays for itself in the end. The benefits of A/B testing in general are enormous. We've increased conversion rates for our clients by significant percentages through the use of Convert.com. A/B testing helps give a quantitative edge to marketing decisions that are often based on gut feeling. It is truly an invaluable tool. "Excellent, easy to use split testing solution for any budget." The user interface and customization of split testing campaigns. I also very much enjoy the ability to quickly tie it into my Wordpress installation. One of the unique features of Convert Experiments is that it allows you to use a WYSIWYG editor to design your split tests. This is extremely useful for making minor adjustments to a page with very little time investment. Setting up goals and working with data is a snap. I've worked with wordpress for about 15 years now and split testing was always one of those topics I avoided like the plague. I'm happy to say that Convert.com not only got me past those initial fears because of the simplicity of setup and ease of use, but they improved my confidence in my ability to perform accurate and reliable split tests so we can make better decisions about changes to our website. Initial setup for revenue tracking was a bit confusing but support got me through that hump. I also would like it if there was a better explanation of how the confidence system works for finalizing split tests. Both minor nuisances though. If you're looking for a comprehensive, easy to use split testing solution then there honestly isn't anyone who does it better at this time. Split testing our product pages to increase conversions, decrease bounce rates and increase engagement. We have realized all three of these by using Convert. "It gets the job done with none of the fluff"
I was looking for an A/B testing tool for my small-medium clients who do not have an enterprise budget for optimization. I researched several budget options but none of them were as polished as Convert.com. Having got started with Convert.com I learned to love it as I've yet to stumble upon a major lacking feature and yet they seem to be implementing the bare necessities without any of the distracting fluff you see in feature-richer products. I personally come from a technical background and Convert.com does a good job at transparency, that is, I can tell what it does and how it does it so I can make sure none of the experiments interfere with other features on the page. I did find a few areas in which I, as a technical user, lack control. For example, you can set up a form submission as an experiment's goal but you can only identify the form based on it's "action" attribute which is often irrelevant in the age of Ajax forms. This example is correct at least for the time of writing this as the product has seen some very nice updates over the last few months. I am a CRO consultant working with small and medium companies to optimize their online funnels (yuvalqen.com). I need a tool that can work for various technologies employed by my clients that would provide a comprehensive solution for on-page a/b testing. A no hassle a/b testing tool helps me optimize websites faster with... you know, less hassle. "More functionality for the money, less flicker." - Claudiu and George on the support team are quick and very thorough, they won't fob you off. - Also, we're on Convert's partnership scheme. - Can't segment within the reporting, but we use other tools to do this. - Experiments sometimes 'call' themselves which is a feature I'd like to have turned off by default. Give it a trial and see for yourself. "Excellent Customer Service & Easy to Use"
It is very easy to set up the front-end variation of your experiment in a short amount of time as well as to set up custom segments and specific goals you want to track. All-in-all will only take a few minutes to set up a basic A/B test. Furthermore, although it is more challenging setting up tests that aren't minor Front-End variations, our developers haven't had too much difficulty finding a way to add JS to the test to get the desired effect. Lastly, the customer service is relatively quick if you're having issues with your tests and I haven't had a question unanswered yet. I believe their dashboard to preview your test works on an emulator and I always get an out-of-date banner in this view so I'm not sure what software their emulator is running with. It'd be nice to see more preview options in that regard. Additionally, I wish I could preview the entire code of the page so I could edit existing code versus only being able to add JS code to an experiment. Make sure to plan out your tests each month so you get the most out of your plan! I'm testing variations of UX and UI to see how it effects certain core conversions of ours. We have found an improvement in click rates for certain things like signing up, engaging with one's profile page, and submitting activities on our site. A tool that isn't a performance hog on your website. It is lightning fast for the price you pay. Audience and site targetting is everything you need to cover 95% of your a/b/n tests. Finally, it pretty much integrates with all the known popular analytics platforms. Synchronization could be faster. Debugging features for smartphones could be better. Experiment changes to websites without having them implemented first and not knowing what the effects of these changes are. "Super powerful but super easy to use"
Sometimes the interface can make it tricky to select the parts of the page depending on how complex the page layout is. This sometimes leads to selecting the wrong part of not being able to affect the right changes. This is where the JS and CSS editing comes in handy. Occasional A/B testing for clients of varying sizes without huge commitment to monthly expenses. The developer account also allows me to demonstrate the value of A/B testing to clients without massive up front commitment. We've used Optimizely, VWO, and others - of them Convert.com was the fastest to setup tests and execute them. It's our preferred platform for conversion rate optimization. Nothing to dislike here - some small differences vs. other platforms, and all editors are subject to weird code issues, but otherwise pretty easy to use. We use Convert to optimize specific actions on our eCommerce sites. I've known the team at convert.com for about 4 years and in that time they have continued to evolve. the platform is a direct reflection of their client's needs. Our agency, Nitro Interactive, has seen at least 5 of our own feature requests put in place. And, hundreds of other upgrades and features have been added. Recently a complete overhaul of the test summary page has been a great improvement. Nothing really. Documentation is getting better and better but I believe there are still opportunities to build out the support docs. Unbounce for example does a great job with this. Try convert.com. Don't waste your time getting frustrated with the competition. We need to quickly overcome technical challenges on more sophisticated tests. The team helps us troubleshoot and expose silly errors and find workarounds when we need custom functionality that doesn;t ship with the platform. "At last, revenue split-testing for Shopify stores"
I tested Convert after being frustrated with two other big split-testing tools that failed to accurately track revenue in Shopify because of third-party cookie problems. This is an unavoidable problem for non-Plus Shopify stores who require the checkout.shopify.com domain to process payments. Convert accurately tracks revenue data and integrates nicely with Google Analytics for follow up segmentation and analysis. Yes! It is probably the most affordable split-testing tool on the market (that has the functionality you need). Dennis and his team provide quick and clear customer support for any questions you have to get your first test live. Currently cannot create a new variation when a test has been published. Required to clone an experiment then re-setup your experiment tracking variables. Highly recommend Convert Experiments for those wanting to optimize for revenue when a third-party domain processes your payments. Revenue is by far, the primary metric to optimize for in ecommerce. I use Convert Experiments for Shopify clients who come to me wanting scientific conversion rate optimization. It is the most affordable split-testing tool to optimize for revenue that works well. Convert is fast and easy. When your wearing a lot of hats as a business owner you need fast and easy for conversion optimization or it just doesn't get done. With convert I've got numerous tests running all the time so I'm always optimizing each part of my site. Convert has completely changed our business. Optimizing over time has led us to beneficial conclusions we would not have otherwise come to. There is a lot of different options of how to make your tests. Let you integrate the tests in your react(or any js code) code. You cant block ip a addresses from seeing the experiment. With convert we are able to identify the impact of our changes o the website. "Very Powerful and Helpful Software"
Convert.com is extremely easy to use. I have limited experience with a software such as this and was able to start with little guidance. Reduces page flicker to next to nothing. Not seen before with competition. Nothing much. They are moving in the right direction but however it is too pricy. "Very good software, great support team"
Support team is very responsive when you have an issue. Easy to use. Great price for what you get. Some small bugs that need to be worked out with editor. * We monitor all Convert Experiences reviews to prevent fraudulent reviews and keep review quality high. We do not post reviews by company employees or direct competitors. Validated reviews require the user to submit a screenshot of the product containing their user ID, in order to verify a user is an actual user of the product. Hi there! Are you looking to implement a solution like Convert?